Imran Khan, like many of us, must have made many mistakes, but his last ex, Reham Khan, was his worst. Having said that, it’s an indisputable fact that Imran Khan leads the second largest political party of Pakistan, for many, it’s a government in waiting. And people who love him are not those who follow him politically- they follow him for his philanthropy and his personal achievements. This man stood the test of time and is loved with all his follies and fortunes by millions. Reham Khan is once again in a dirty dig to tarnish the image of PTI and its Cheif, Imran Khan. What a declass political level is this when you stoop to the level of coaxing you opponent’s ex-wife. Is there any limit to such a fall? May be, no. Divorces are always bitter, rough, and glutted with anger. But very few start and end up with agendas and schemes. Reham Khan, who was divorced by PTI Chief, Imran khan in 2015 could never move on.She could never stop herself from taking her grudge out in public against her ex-husband. And she is good at such theatrics. In February this year, she told to Indian media,“except for “marriages” (she used the word “shadian”), her every move is well-thought-out.” Well, to the best of our knowledge, her “every” move is well-thought out. Be it her marriages or her performance as a honey-trap by the rivals of PTI, she is good at what she does. For long, she has been tipping off her upcoming book as a great disclosure on her experiences with PTI and Imran Khan. She threw the same invective dregs on her first husband Dr. Ijaz Rehman (married1993–2005), , father of her three kids. Being a woman, her jaundiced slurs could be justified but her meet-ups to PML-N leaders in the wake of so many controversies, and with memo-gate-famed Hussain Haqqani who is trying to re-imagine Pakistan from India and considers Pakistan-a dysfunctional nuclear state, smells rat. In addition to many credentials of Haqqani, he is the main lead in memo-gate scandal, and the one who considers the war of 1971- an ethnic cleansing operation by Pakistan army. 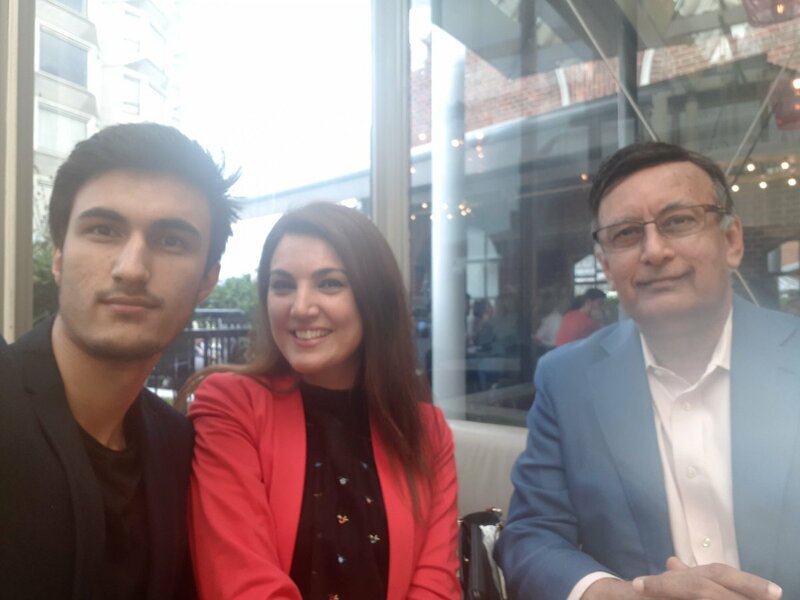 Lately, Reham Khan was spotted with Haqqani in London for allegedly discussing her book. There is nothing conscientious , intellectual and sanctimonious in criticizing the judiciary of Pakistan with its arch-rival, India. And that too for petty gains. And in the following exchange with Ahsan Iqbal, former Federal Minister of PML-N , you will find her talking to Iqbal about Maryam, planned meetings and casual dinners. But the most important line in this entire exchange was when she requested Ahsan Iqbal to “educate” her on how to use that “information”. This exchange promulgates the intent behind the entire narrative of the book, and also renders an exposé on the political ethics of PML-N.
Rest assured, her sold and planted narrative won’t be next to gospels in any shape and form to dissuade PTI followers and Khan lovers. Writers are appreciated on merit, intellectual class, and authenticity. And, so far, the optics and leaks are betraying any such promise, denuding the latent intent of the author;Reham Khan. Follow the author on Twitter at m_r_a_.